.MD Wellness Experts | What's this bump on my eyelid? What's this bump on my eyelid? On almost a daily basis, we see many of our patients come to the office with a complaint of a bump on their eyelid. This often can be a benign lesion which is commonly known as a stye or chalazion. There are many oil glands in the upper and lower eyelids which have small openings near the area where the eyelashes meet the eyelid. If these glands plug over, a stye may occur. The oil continues to be produced but cannot leave the gland and go into the tear film. This results in a "back up" resulting in a stye or chalazion. Patients with oil gland problems or adult acne, known as Rosacea, are more prone for these types of problems. There is another condition called Blepharitis, or matting of the eyelashes, which can increase the risk for gland blockage resulting in a stye. Many of these patients will use eyelids scrubs, with or without Johnsons Baby Shampoo, to decrease the matter on the lashes and hopefully decrease their risk for getting a stye. Early treatment for a stye increases the chances of resolution of the problem with a conservative management. Heat and pressure with a wash cloth applied to the stye approximately 10 minutes a day (once or twice a day) is one of the best treatments to open the gland and allow the oil to flow out again. Some patients may also need a topical ointment or even an oral antibiotic. 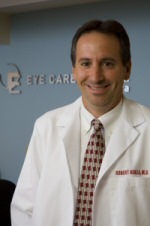 If the stye doesn't resolve in the first few weeks, there is a greater chance that more aggressive therapy is needed. We often may need to do a steroid injection into the lesion or even removal in the office if necessary. If a bump or lesion appears on the eyelid area, consult your eye physician to rule out any significant eye problem. Assuming the lesion is a stye, your doctor may prescribe some of the treatments mentioned above. Good eyelid hygiene is always a smart preventative approach to decreasing your risk of a stye or chalazion.